​474 - Jason Blood is born a member of the Druids of Cymru. ​496 - 22-year-old Jason is knighted by King Arthur. ​513 - 39-year-old Jason falls in love with Morgaine Le Fay. ​517 - 43-year-old Jason betrays Camelot for Morgaine Le Fay, who in turn betrays him. Merlin punishes him by bonding him with Etrigan. he participates in the 2nd Shadowpact. ​35 years ago - Jason & Zatara manage to coerce Etrigan to stop Morgaine Le Fay from breaching the Paths Beyond and freeing Mordred. 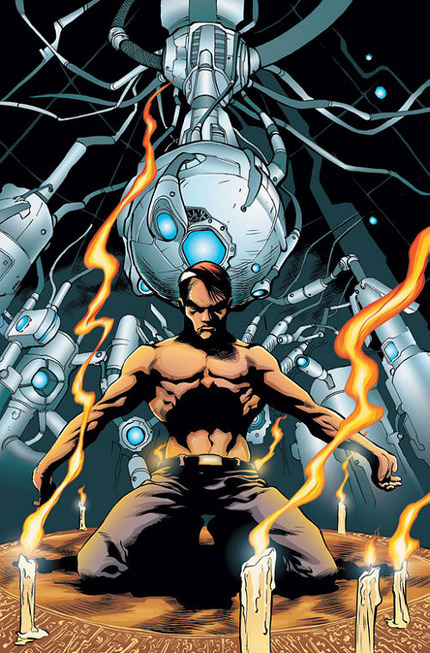 11 years ago - Jason first works with Batman, who comes to trust and empathize with his battle with his demon. 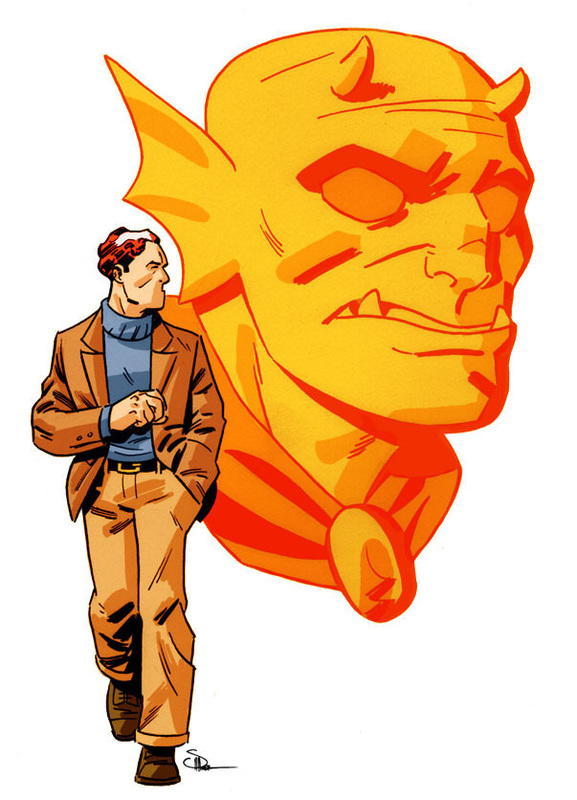 6 years ago - Etrigan deals with Dan Cassidy, agreeing to battle the demon Nimbos for Eddie Bloomberg's soul, reverting Dan into a full demon in his service. ​5 years ago - Etrigan appears as one of the demons vying for Superman's soul, leaving Jason as one of the only witnesses to the event. ​4 years ago - Dan Cassidy ventures into hell to free himself from Etrigan's control, freeing an imprisoned Angel & stealing Lucifer's trident, upsetting the balance of power in Hell. ​3 years ago - Etrigan usurps the Lord over his circle of Hell. with his heightened power, Jason gains more autonomy on earth. 1 year ago - Jason is recruited into the Outsiders. he helps Tatsu Yamashiro venture into her enchanted sword to free her family. The Demon Etrigan is raw Jack Kirby awesomeness. He's high concept, immediately recognizable, and savagely brutal storytelling. He's been a background character for decades, but frankly, that's as high profile as a Jack Kirby character can expect to be, because they look absolutely insane when compared to everything else. We've deliberately used Jason Blood as the foundation for all the characters of Arthurian legend, using his timeline as the central focus of that entire group of characters. Also, as he is by far the highest profile denizen of Hell in the DC universe, including Etrigan is a great way to show the interaction of the demon realm with the heroes of earth, in particular Blue Devil. Etrigan becomes the Demon in control of his fate. The idea that Etrigan usurps the lord of his circle of hell is a sort-of nod to Reign in Hell, a series that managed to include more abortive attempts to restructure continuity than anything I've ever read. It's a real mess, but reading it is a delight if only because of it's audacity, and the idea of Etrigan assuming a higher rank in hell also allows for the idea that Jason can assume more autonomy, clearing the way for him to join the Outsiders. Jason actually did join Nightwing's replacement Justice League team during the Obsidian Age, and that always struck us as a good idea. Jason is an ancient spellcaster forcefully bound to a high lord of hell, and that makes for a fascinating character. We're very excited to make him a part of the Outsiders.